Filmed, Directed and Edited by Alice Cunningham, Ami Harmer and Sophie Whinnett this video was created as a part of their Video and Media Coursework. It’s important to keep a positive mindset! It’s important to keep a positive mindset! It’s important to keep a positive mindset! It’s important to keep a positive mindset! It’s important to keep a positive mindset! It’s important to keep a positive mindset! It’s important to keep a positive mindset! It’s important to keep a positive mindset!………Even if there are only 6 people in your audience. This is often the challenge with touring. Sometimes you get a big crowd and sometimes it’s tough to be able to justify calling it a crowd at all. But here’s the positive bit. 1. The place was a small/pokey Tokyo Cafe and so 6 people made it look kinda half full. 2. I sold 6 CD’s. Not bad!! CD per person on average. That’s enough to cover my sleep for the night travel to the show and food for the day. Plus (And this is the main thing), I REALLY ENJOYED PLAYING!! 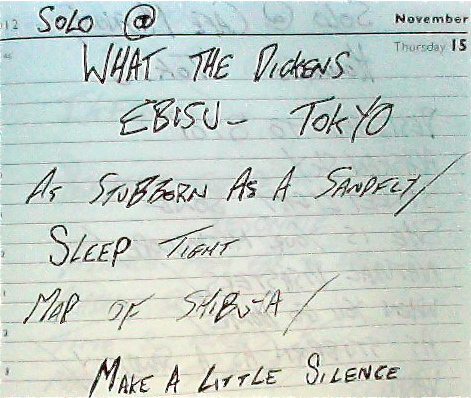 I was super relaxed and played a bunch of songs at this show that were only this once on the whole Japan tour. ‘Designed To Stop’, ‘Streetlight Song’, ‘When You Go Home’ & ‘Cage is Rattling’ made their single live appearance this night in the tour. Filmed & Edited by Maxine Nicholson Natasha Swallow, Daniel Kenchington and Sophia Powel this video was created as a part of their Video and Media Coursework. Chaos! This place is always chaos. Drunken Gaijin stumbling around the dimly lit bar bumping into folks and eye balling the beautiful Japanese girls who are (to be fair) often there looking to meet Western guys. But none the less the atmosphere can at times feel like you’re blending with the low brow side of human kind. This was emphasised by the arrival of a good friend from the UK who had yet to witness this enviroment as it was only his 3rd day in Nippon. Dom Graham (an experienced and accomplished guitarist in his own right) looked on in partial shock at the debauchery that lay in front of him as he entered the venue. “There are too many dickheads in this place for comfort” he uttered to me. None the less this was a gig and I am here to play it. The night was organised for charity to help feeding starving homeless kids from Indonesia I believe. But apart from that it was tough to find the good a performer could be doing as playing to the chaos was always gonna be a challenge. The venue also has a good PA system but no-one is manning it so I’m left to work the desk which is unfamiliar. It does my head in when a venue has events with heaps of bands but not a single soul is there to help the musicians with sound of logistics. I was lucky to have some of the other performers come to my aid when trying to work the rig out and also I once again had help from good friends Sou and Jerry (Jerry has been mentioned I a previous blog recently). 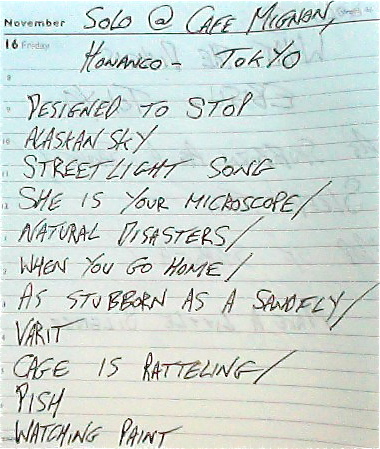 The set was short at only 4 songs and generally it was synth laden psychedelic prog folk until final tune ‘Make a Little Silence’, which sent in a bit more of a Bossa Nova route. I did also have a wonderful moment when member of the audience joined in with ‘Map of Shibuya’. Even if they are folks I consider to be friends it’s important to remember these folks only know me from touring and so it’s fair to say they could be fans also. But none the less another night survived in this big eastern smoke.